I never thought of myself as a competitive type, mainly because I was so crap at sport when I was a kid. I was especially rubbish at anything that required you to connect a foot or a bat or a racquet with a ball. I wasn’t a high jumper or a cross country runner or a sprinter, the prospect of getting puffed out or covered in mud just didn’t float my boat. Recently however; I’ve come to appreciate that actually I am very very competitive. Every morning for the past year and a half, I have cycled across London from Waterloo Station to my office in Canary Wharf and back in the evening. When you start it’s a scary thing to do. London is a huge Metropolis teaming with cars and people and being on two wheels makes you feel fragile and inconsequential, but after a while you realise that actually it isn’t that bad. In fact at most junctions in central London cyclists outnumber cars and what ones there are travel quite slowly. The same can’t be said for the bikes however; every light change unleashes a tempest of wheels, Lyrcra and testosterone. (I don’t subscribe to the Lycra personally.) It’s utterly compulsive, you might convince yourself before you set off that you are gong to take it easy but at the first junction all that falls by the wayside. I always arrive at my destination out of breath and hot enough to burst because I’ve raced all the way. There’s a rigid pecking order out on the streets: the racer boys with their shaved legs and gaunt faces, the narrow-handlebar-metro-types with their iPods and their deathwishes, the middle-of-the-roaders on their middle-of -the-road bikes with mudguards and pumps and bells, and then there’s people like me on our folding commuter bikes. We know our place. We might have legs of steel and super fast bikes locked up in the garage at home, but because we travel in from the shires on commuter trains we are encumbered with these folding parodies of bikes. 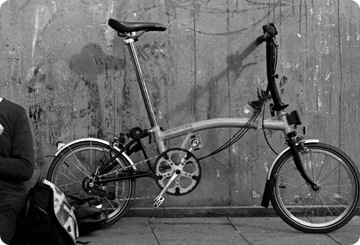 Don’t get me wrong I’m not knocking them, the Brompton Folding Bike is a marvel of design and engineering. From the way it tucks itself up into a package so neat that it draws gasps from tourists to its astounding strength and stiffness when you ride, there is nothing to compare. The problem is however, the wheels are too small and it isn’t very fast. No matter how hard or how fast you pedal you are never going to keep up with those racers.